Historical ideal for those wishing to spend - at any time of year, thanks to the mild climate even in winter - a relaxing holiday in, unshackled from clamor of the most popular tourist destinations, all easily reachable by virtue of geography favorable. 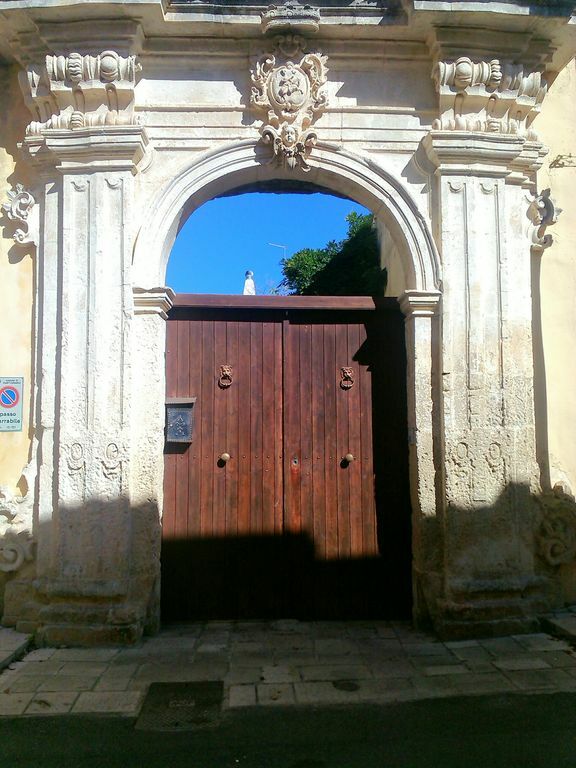 Located in the heart of Martignano, [the smallest municipalities (1,800 inhabitants) of Grecìa Salentina, the ancient area located at the center of the Salento] along the way oldest in the country, which joins the Church matrix with the most famous monument, Palazzo Palmieri. It's consists of an original planting portions seventeenth century and of later eras, has ten rooms, all with the times "barrel" or "Star", as well accessories, for a total of 250 sqm. The furnishings are enriched by the presence of two chimneys ( "focaliri") and two barns left buried "in sight". The first floor is the "suppènna" (literally shed, stable open from one side to allow the airing of personal), now fully restored when there is another fireplace. It has three entrances that face the "court" common that you access from the outside through a portal in Baroque style in the second half of'700 and, on the back of a garden ( "Ortale") of approximately 700 square meters, where spend time relaxing in the shade of orange trees, lemons and manderini. Value for money is of particular interest because you can get a structure that offers ample living space and priced very suggestive content and that is inserted in a simple and austere, not influenced by artificial tourist practices. Thoughtfully restored family property with original features in the historic centre of this small town. Many rooms and large garden. We stayed in July with temperatures at 30+ and the house was cool due to the beautiful high vaulted ceilings. There were also some fans provided if you needed them. Single bathroom and kitchen were clean and in keeping with the property. We cooked a few times and everything was at hand. You will need a car to stay here and we were able to park nearby. The coast was about 30 mins away and the beautiful city of Lecce even closer. Good road links just outside the town to the rest of the peninsula. The coastal town of Otranto to the south is beautiful, as is the coast road all the way to the tip of Italy and round to Gallipoli on the west coast. Ostuni to the north is also fantastic. The whole area is undeveloped compared to other parts of Italy and is renowned for its seafood and local produce and dishes. A few words of Italian will be useful, but everyone we met was welcoming and friendly. Pantaleo the property owner ( the property has been in his family for hundreds of years) is very friendly and helpful. We would recommend the house and location for exploring the area and experiencing real Italian life. The first weekend we arrived was the towns festival with a huge open air meal and music in the town square. This was celebrating the Greek heritage of the town and the local area. This property occupies half of the ground floor in a Baroque courtyard. It is spacious and impressive, with high vaulted ceilings, and provides an oasis of comparative cool in the sweltering heat of August in Apulia. There are many spare rooms and a courtyard garden with lemon trees. The facilities are adequate and the owner is very helpful. The area is interesting to explore and unspoilt. Unreservedly recommended. "We had a wonderful stay in this beautiful house. The photos do not do the house and garden credit. The house is large and spacious with a beautiful old fireplace in the kitchen that we used in the evenings. Our children had a wonderful time playing in the garden. The weather was perfect and we had wonderful breakfasts outside in the garden. The village where the house is located is pleasant with a bar, 2 supermarkets, 2 butchers, 2 bakers (wonderful bread baked in local woodburning ovens) and a fish shop. The location is great for visiting the local beaches with a car. Altogether we had an extremely relaxing and pleasant holiday The owner was helpful, kind and discreet". Le propriétaire est très gentil. La maison est très grande. Il n'y a que 2 chambres mais de nombreuses pièces, très grandes. La décoration est assez old school, typique de la région je suppose, je ne m'y connais pas assez. Nous avons eu chaud en ce début août, c'est le seul reproche. Le jardin aussi est grand, la terrasse permet de manger dehors, ce qui est agréable. Le village possèdetout ce qu'il faut, et est très bien situé pour rayonner. Lecce est seulement à une quinzaine de minutes, il y a un hypermarché à 10min, la plage de Sable Foca où l'on peut se garer gratuitement est à 20'. Au coeur d'un village typique animé par ses fêtes annuelles, cette maison possède un charme unique. Ses grandes et nombreuses pièces voûtées (11 au total !) et son grand jardin planté de citronniers offrent sérénité, fraicheur et calme, si ce n'est la rumeur du village comme la cloche de l'église rythmant la journée. C'est la troisième fois que nous y retournons, appréciant l'écart des vagues de touristes du littoral, et l'ambiance du village où les habitants saluent "les français" avec malice. Situé à une quinzaine de km de la mer, proche de Lecce, d'Otranto et de Maglie, c'est un point de chute idéal pour être au calme après les escapades. Dans le village allez chez Luigi goûter ses fameux pasticiotti, ou dégustez un cappuccino pas cher, verre d'eau minérale compris ! Pendant ce séjour, vous aurez l'impression de faire partie des privilégiés qui ont vécus dans ces murs depuis... 1592. Ricevere l'apprezzamento dei propri ospiti ripaga dell'impegno di un intero anno. Tariffe in funzione del numero di persone ( da 2 a 6). Caparra richiesta al momento della prenotazione. La consegna delle chiavi avviene da parte del proprietario non residente a Martignano.